Originally, I had planned a full day in San Francisco. 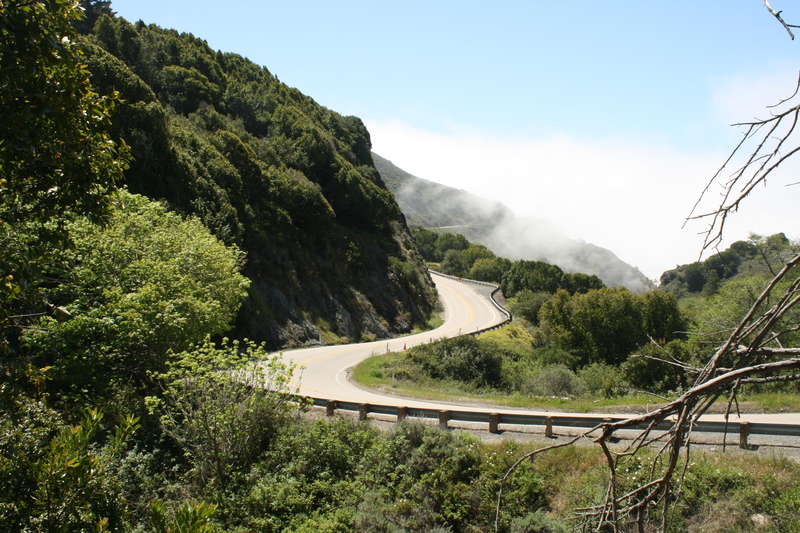 I had no idea that driving through Big Sur at our pace would take an entire day, even with limited stops. Then a few days before my flight out West, I reworked our rough itinerary to delete the City by the Bay. That meant we hadn’t reserved a campground early enough for Saturday night. 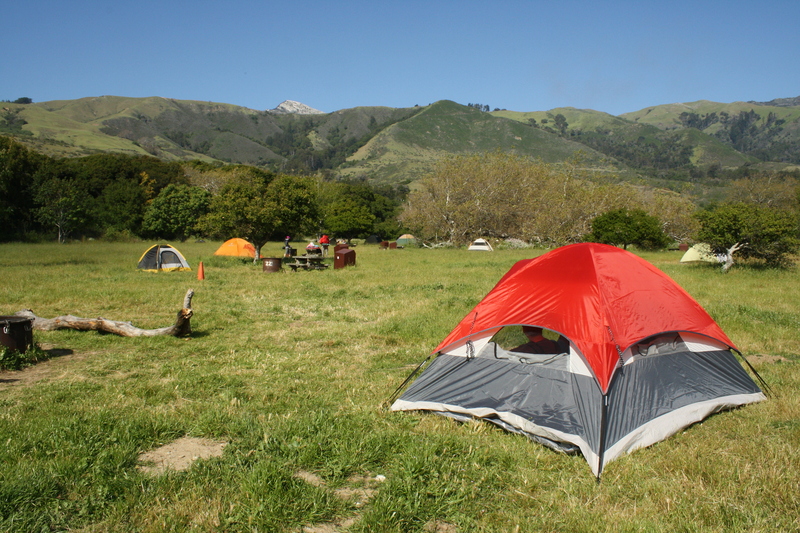 We hoped that a first-come first-served spot at Andrew Molera State Park, at the northern end of Big Sur, would still be available. Each of our stops along the way were hurried — we needed to sleep somewhere. 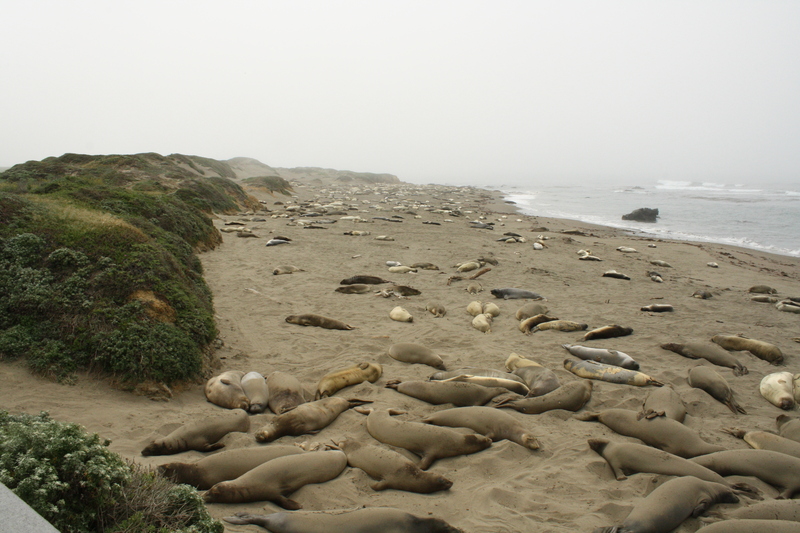 We snapped photos of giant Elephant Seals covering the beach at Piedras Biancas. They’re only on land a few months, catching up on their sleep, sand tossing and snorting. At least that’s all it seemed to us that they do. Can I have one as a pet? It could live in the bathtub. We picked up a personal sized olallieberry pie in the small town of Cambria. Tom read about it in a road food book I borrowed from the library. He loves pie and berries, and I love bakeries, so it was a natural stop. Linn’s of Cambria. 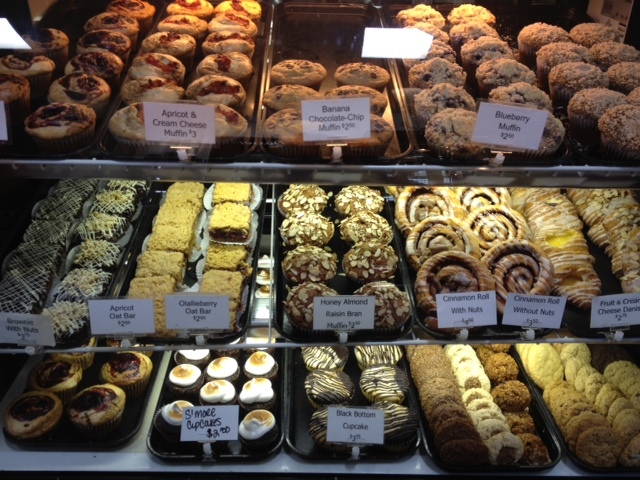 One of everything, please? We settled just on a mini pie. 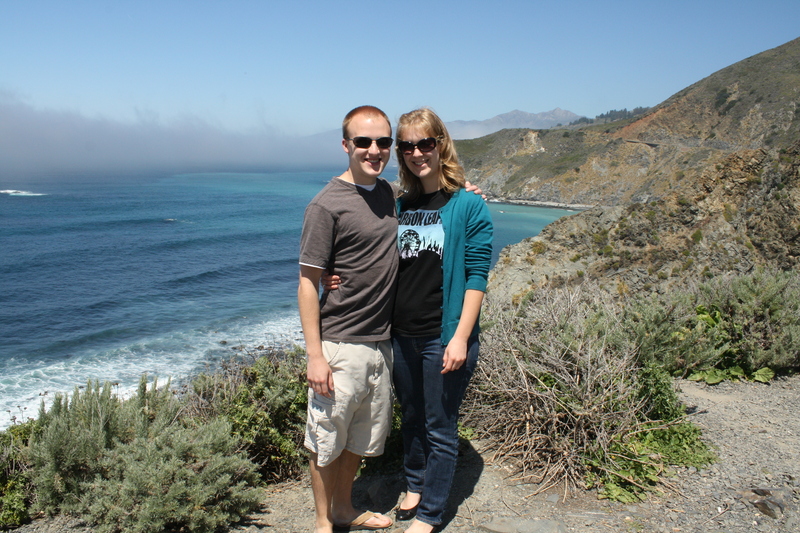 We took photos at the few sunny spots in Big Sur, when the fog left us in peace for just a little bit, giving us a chance to eat one of our many roadside peanut butter and jelly sandwiches. At each of these stops, we hoped a campground would have a few space. And just barely, we claimed one of the last two in the area. Of course, it was a primitive walk-in site, so we had to carry our pillows, sleeping bags and firewood about a half-mile along the Big Sur River. Had we arrived an hour later, we would have been sad puppies and not had this gorgeous site. 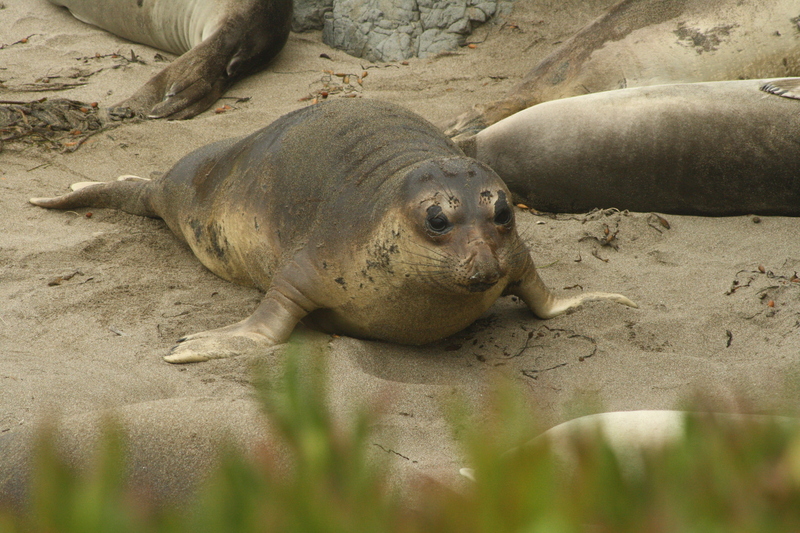 After setting up, we hoped to drive north just to Monterey, perhaps to enjoy the Seventeen Mile Drive or see the playful otters at Fisherman’s Wharf. 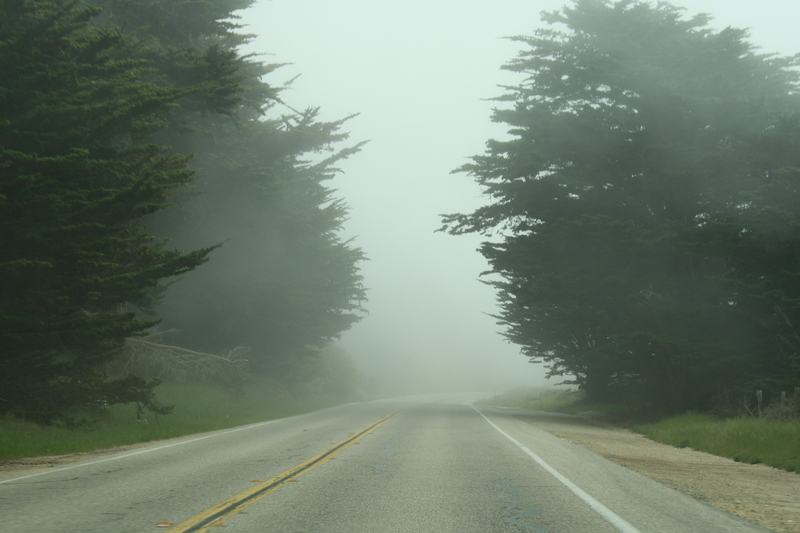 But with fog completely covering the roads, and the sun quickly setting, we filled up with gas in Carmel, grabbed a few additional items at a grocery store for our dinner (including aloe vera for poor Tom’s burnt forehead), and headed back to our campground. That’s when the crows struck. We left the extra food on our picnic table while we took a stroll down to the beach. 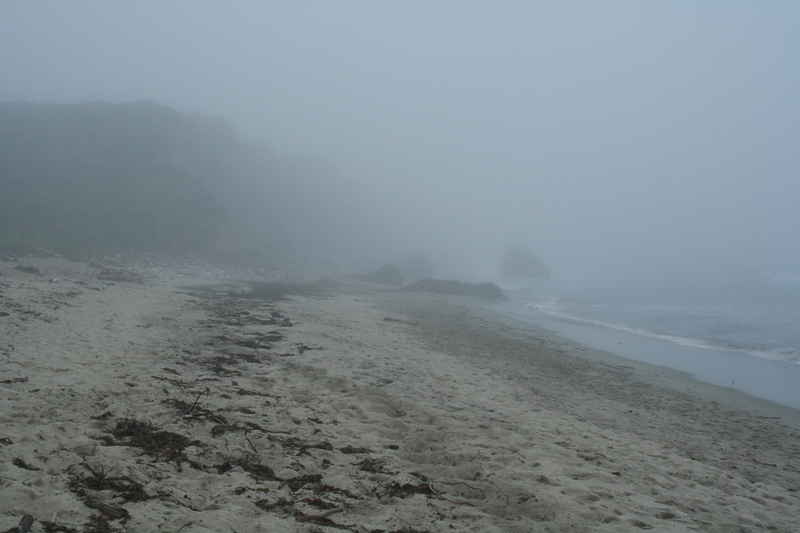 Of course the beach was covered in fog too. We were gone less than an hour, but everything we had just bought was gone. All gone. Our camp neighbors said he tried to salvage what he could, but he was too late. Gone was the cheese and roast beef, pretzels and extra veggies. Luckily, half of our food had been safe in the small metal storage unit at our campsite. But hummus with graham crackers and foil-wrapped “silver turtles” without meat for Tom (only potatoes, red pepper and squash) weren’t quite the same. At least we still had the s’mores. Wow, What a cool trip(except for the crow attack!) 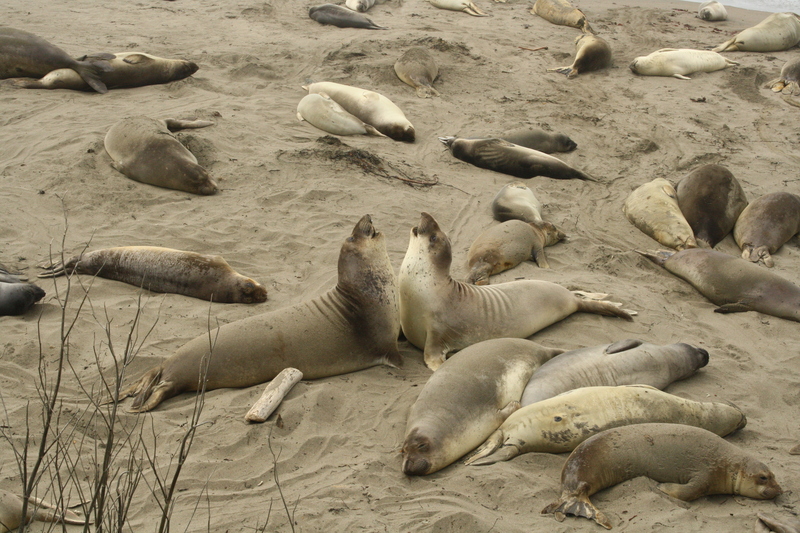 and so glad you shared the seals too — what a sight!